Welcome to Alasdair Duncan's online notebook. This is to be a collection of material that relates to my work as an artist: found things, and things that I've made, essays, videos, reviews, photos, or isolated notes. A friend of mine, Tokyo based artist Kyoko Ebata, recently made an artwork that I find quite interesting. The artwork was titled Washing Hinomaru, 日の丸の旗, the Hinomaru being the national flag of Japan. The artwork, the performance of a ceremony, was conducted in a small old laundrette located next to an old bathhouse in an unglamorous area of Tokyo. 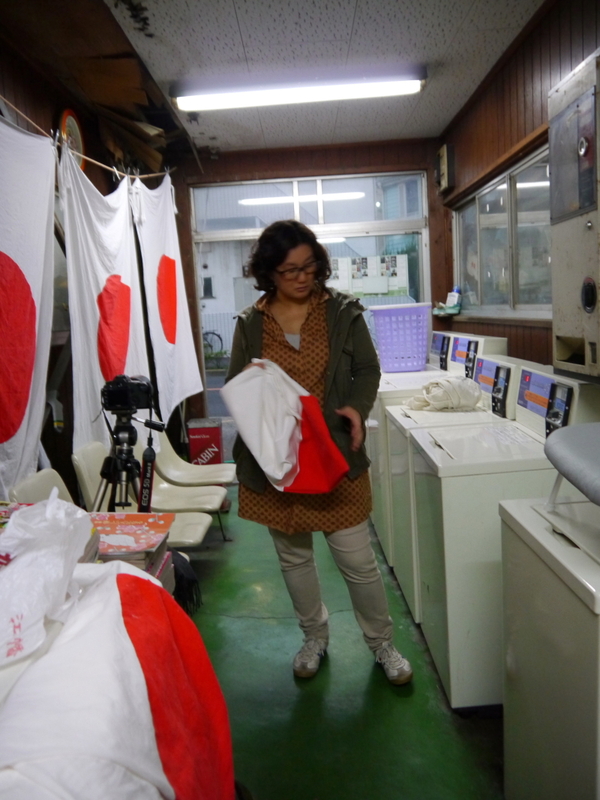 The ceremony that was performed for ten days, was the repeated washing, line-drying, ironing, and folding of a number of Hinomaru flags. The line drying of the flags doubled as their display. The performance had come out of some works she had been doing which involved newly invented ceremonies which seemed to employ or explore the ways ceremonial liminal force might work. Ebata was interested here in confronting the power of the flag and its meaning. The status of the ceremony was not immediately explicated for those who encountered it - people who had come to see art, local people there to do washing, or to bathe in the bathhouse, and people who were passing who were curious about what was being done. The artist performed the ceremony herself. When asked about the meaning of what was being done, whilst acknowledging that it's art, she offered more or less oblique but loaded responses such as saying that she thinks "the flag needs to be washed". Such statements echo the structure that the ceremony itself in that they work as 'oracular' speech - speech which, like that of an oracle, is ambiguous but pregnant with meaning. Speech which calls for interpretation, drawing out interpretations that are proper to the recipient of the speech or the ceremony, and not to the speech or ceremony itself. In response to the great variety of reactions to the ceremony, Ebata started gently eliciting responses and recording them. Right wingers would see her care for the flag, and might associate the washing with the longstanding ceremonial traditions of cleansing and renewal to which they are sympathetic. Leftists would see a critique, perhaps the washing was akin to Lady Macbeth's hand washing - a traumatised repetition, a mark of national guilt. Feminists could read a critical idea about 'women's work' into the endless effort of washing. The red of the flags started to fade a little, and this too could be infused with meaning. A fashion oriented cultural critic refused to see politics, rather seeing the flags in relation to faded jeans, as a potentially marketable fashion. Some older artists were reminded of the 'happenings' of their youth. Others felt melancholy from various stances. From each strictly according to their disposition, each with some strength of belief in their own interpretation, and a tendency to a certain blindness to other ways of seeing it. Ebata's recordings constitute material for another stage of the piece. Part of the originary myth of the national flag of Japan, the Hinomaru, lies in a 7th century message sent by Prince Shotoku to the Chinese Emperor, which began with words effecting "from the sovereign of the rising sun, to the sovereign of the land of the setting sun", perhaps marked at the top with a red dot. Japan is only the 'land of the rising sun' from the perspective of the West (since the sun rises from the East), there is thus embedded in the Hinomaru a strand of national identity that openly defines itself intersubjectively in relation to the gaze of an other, the other of the West. To this extent the Hinomaru is a marker of intersubjective difference as such. Art that functions effectively for a public is uncommon - as Liam Gillick observes, it's easy to have an audience - a group that coalesces around what's made or done, but it's much more difficult to relate to the public who are greatly more diverse than an audience, for whom the work does not represent a common cause. What is interesting in Washing Hinomaru is that by appealing not principally as an artwork for an art audience but more ambiguously as a ceremony, the public was able to engage in the work. And in making that ceremony operate in an oracular manner, all participants were equal in their varied relations to the piece. The response of an art critic is no different than that of an office lady insofar as they supply the meaning of the ceremony. All are made actors in the work in a sense, their provision of meaning being part of the performance. None were privileged in their experience of the work. It's a rhetorical claim of Thomas Hirschhorn that he is not a political artist, but an artist who makes art out of politics. The difficulty for his claim lies in the fact that there is an assumption underlying the reception Hirschhorn's work that is broadly of the Left - imagine how we, as a typical art audience, either Left leaning or giving strong allowances to such a position, might receive the work if we assumed him to be of the hard Right. With this thought we can see the extent to which he is indeed a political artist. Hirschhorn's position is based on assumptions of a particular audience, not the public. What might seem to be work that plays with and perhaps exposes something of the workings of political affiliation is actually a veil for a stage of those workings. Washing Hinomaru seems much more closely to fit Hirschhorn's rhetorical claim, since Ebata's political assumptions are not so readily available to the assumption of one audience over another. What is confronted of the flag is its effectiveness as a mark of difference as such. What can be confronted of the flag in the further staging of Ebata's recorded material, is not just its meaning to a variety of given audiences, but the heterogeneity of it's meanings to a public, and the gap between these. Ebata's performance can also be compared to the work of Kumazo Yoshimura, who has repeatedly used the Hinomaru as a motif, and whose approach to the motif is comparable to Ebata's - as a subject to be confronted. Yoshimura's work is gallery based, and stylistically codified to be legible as art - it looks like art. His work is for an art audience, it is not public art. There is little chance that his work will elicit strong responses beyond the distanced politeness of the gallery. In this sense there is little risk in his work - there is little by the way of actual confrontation with the subject at hand, merely the signification of such a confrontation. It's not that Yoshimura's work is bad, it's quite interesting and effective as gallery practice, it's merely limited in terms of what it's able to do with it's subject matter.